We are all looking forward to the coming season, like every Club, with optimism and will update our news, views and Links to Match Reports throughout the Season. New format for the West Region League 2 with 15 teams competing. During the close season we have built a new Website to replace our `old` one (which will still remain for viewing). New manager about to be announced apparently? It is with great disappointment that Robert Docherty has stepped down from his role as Ashfield Manager due to personal circumstances. `Doc` has been a terrific ambassador for the Club in the past 3 Seasons on and off the Park. Despite a big improvement last Season, the Club didn`t quite manage promotion which would have been aptly deserved for Doc and his Staff`s efforts. It goes without saying that the biggest achievement in Docs reign has been the creation of our Academy set up with over 150 Kids involved from Ages 5 to 15 years old. Whatever happens next for Robert we wish him all the very best. A terrific coach, ambassador and Manager and the most obvious a terrific guy and gentlemen. All the best Doc and thank for all your endeavours. We are delighted to announce that Paul Maxwell is the new Player/Manager of Ashfield F.C. Paul will be ably supported by Ex-Ashfield Midfielder Ryan Cairley who will join the Club as Assistant Manager. We wish them both all the best..........`mon the `field !! After Pre-Season Friendlies against Greenock and Irvine Meadow it was down to competitve business at the Peugeot Ashfield Stadium yesterday with the two `Maxi`s locking horns as Ashfield welcomed Rob Roy for the first time in 6 Seasons. It was a case for the home side that the game was over before it really started after a whirlwind start from Rob Roy saw Ashfield 4-0 down after half hour and staring at a very heavy defeat. In between conceding the goals the field had Jordan Lynch in the Ashfield defence having to go off injured and John Gaynor hitting the bar during a frantic start however a combination of terrific play from the visitors and bad defending showed Ashfield what it was like to play a SuperLeague Premier side and how clinical they can be. To be fair to the `field they rolled up their sleeves and finished the half strongly with a header from Mark McManus reducing the deficit and Alan Cairns being denied by the legs of the Rob Roy Keeper. The second half was less frantic and when Rob Roy scored their fifth the home side had to work hard defensively and offensively to ensure no further damage and were unlucky on a number of times not to claw back some of the deficit being denied by the Rob Roy Keeper. The `field must dust themselves down and prepare for the visit of St Roch`s on Monday before heading up the road to Petershill on Wednesday.......`mon the `field. It all starts in earnest today and a Season we are very much looking forward to. Some new places to visit and we have a young squad that will improve week on week. The League Cup was an excellent early season test against SuperLeague opposition and we are all looking forward to first game at Carluke this afternoon...........`mon the `field ! Great start to the season for " The field" 5 games and 5 wins, increase in crowds and a vibrant youth academy. Mon the field! Ashfield F C 2018-2019:- Top Row (L-R) - Ryan McLaughlin, Kenny Hadden, Dean Leverage, Graeme Hearton, Mark McManus, Gavin Goodall and Jordan Lynch. Middle Row (L-R):- Nicky Hughes (Kit Man), Gary McLenaghan (GK), Alan Cairns, Gordon Passmore, Michael Giblin, Billy Stevenson, Colin Leverage, John Mullen (GK), Robert Fairfield (Physio) and David Goodall. Front Row (L-R):- Patrick Cullen, Ross Hamilton, Ryan Cairley (Assistant Manager), Ciaran Friel (Captain), Paul Maxwell (Player/Manager), John Gaynor and Keigan Parker. Good to see Ashfield getting a bit of success. Took the Talbot scalp on a few occasions in the past. I always look for their results. Many thanks for the message, Indeed we are in process of building another good team with right blend of youth and experience in order firstly to get out this difficult League. After that then our aim will be to get back to the higher Leagues. We always talk about our games with the Talbot fondly, one of our best performances was in the WoS Cup Semi at Auchinleck (3-0) however for me unfortunately one of the one`s that still sticks in the memory was when we reached the top of the Premiership for 1 week after winning 5 out of our first 7 Matches as `new kids on the block` in the League when Messrs Spence, White and Milliken gave us a masterclass in beating us 9-1 to bring us back down to earth !! Bright sunshine greeted both teams onto the Saracen turf as Ashfield and Vale of Leven set about getting `back on the rails` after last week`s defeats against Newmains and Lesmahagow respectively. Ashfield made two enforced changes and started with Patrick Cullen and top scorer Graeme Hearton in midfield berths with Billy Stevenson back in action partnering Keigan Parker up front. It was the visitors that made the first chance of the match in the opening minutes as McNaught got clear of his marker only to be denied by the legs of John Mullen in the Ashfield goal. Ashfield heeded the warning and played some nice football resulting in a number of corners. Ashfield almost went ahead in the 12th minute when a lovely whipped in corner was met by Ciaran Friel and his glancing header missed the far post by inches. A few minutes later however and the `field went ahead following a sweeping move. Keigan Parker picked the ball up just inside the Vale half and drove towards goal before slipping in an onrushing Graeme Hearton. The ex-Rossvale striker drove the ball low and hard towards goal with the Vale keeper getting something on it which diverted the ball onto the post only to see Billy Stevenson tap the ball home despite the attentions of the Vale defence. Ashfield 1 Vale of Leven 0. The `field continued to press and Kenny Hadden`s long throw-ins were causing problems in the visitors back four however on the whole the Vale Keeper did very well. Billy Stevenson and Mark McManus had efforts which went narrowly over the bar as the home side finished the half on a high. HT:- Ashfield 1 Vale of Leven 0. The home support were clearly hoping that missed chances would not come back to haunt them however this game was a completely different affair in the 2nd with the Alexandria outfit putting on an excellent show which was appreciated by their travelling support. The visitors seemed to re-organise their front line and put the `field back four under pressure firstly in the 55th minute, following a sweeping move the ball broke to a midfielder who drove the ball low and hard past John Mullen only to see the ball cannon back off the post and straight into the arms of the big Ashfield Keeper. A real let off for the `field. Next up was a succession of corners which on the whole were well defended however the last one saw an onrushing Vale player win the header only to see the ball blocked on the line by Paddy Cullen. The `field were restricted to break-aways and they still looked dangerous with Stevenson and Hearton going close however with 12 minutes to go the visitors equalised. A move down the left wing saw the ball cut back into the penalty spot area with Gallagher for the Vale being first to react as he volleyed the cross into the top corner of the net to the delight of the travelling support. Ashfield 1 Vale of Leven 1. The match then began to become very open as the home side went in search of trying to get a winner. This was helped by the dismissal of a Vale player for a 2nd yellow card with 8 minutes to go. Ashfield Captain Ciaran Friel thought that he had won the Match for the `field as he weaved past 4 defenders in the 90th minute only to see his net bound effort blocked by the legs of the Vale Keeper. Referee Craven brought proceedings to a close shortly after and taking the whole game into account, a draw was probably a fair result. Both teams had put in a very good shift and as for the `field they still remain top of the League albeit are now `catchable`with Lanark and Lesmahagow`s game in hand. The `field`s next League game is a mouth watering one at Lesmahagow on the 6th October at Craighead Park however before that the League takes a rest and Ashfield welcome Banchory St Ternan to Saracen next Saturday (29th - 2.30pm KO) in the 2nd Round of the Scottish Junior Cup. (Photos of today`s game on `Match Photos` Section). Looking forward to visiting Craighead Park on Saturday for the Lesmahagow-Ashfield Match. I haven`t been there since January 2009 - all the makings of a cracker. Big thanks to Jonny Rae for putting this together. I think everyone heading along to the Match yesterday were expecting a typical Scottish Junior Cup Tie and that is exactly what they got. Ashfield had watched Neilston at Larkhall last week and knew that they were up against a very good side with the front two of Patterson and Stewart particularly catching the eye. The weather had been kind and although chilly it was brilliant sunshine for the whole match which started with both teams playing in their traditional strips. It was an extremely competitive opening with both teams giving their all however the game was punctuated with free kicks and offside decisions early on. A couple Ashfield players found themselves in the book for first tackles so knew the boundaries that Referee Ryan Lee was willing to go to and infact the young East of Scotland Referee had a very good game. 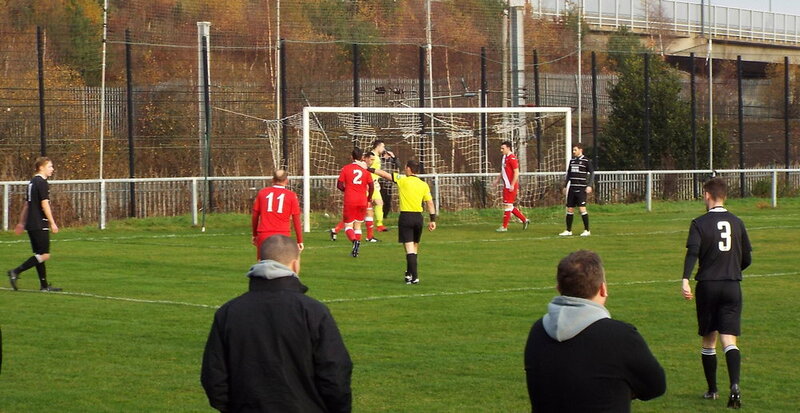 The `Farmer boys` were beginning to exert some pressure on the home side as the half wore on with a number of free-kicks and corners and the `field were happy to hit Neilston on the break and this route almost paid off on the half hour mark when Gavin Goodall broke free of his marker and as Tiropoulos in the Neilston goal advanced, the young Ashfield striker lofted the ball over his head and agonisingly the ball landed on the top of the net. Ashfield were made to pay for this as 2 minutes later, Neilston went in front courtesy of a wonderful solo goal from Paul Stewart. The Ex-Arthurlie player gathered the ball on the right wing before evading a tackle and drove into the box and by that time nobody could touch him and he finished low to the Keepers` left to the delight of the travelling support. Ashfield 0 Neilston 1. 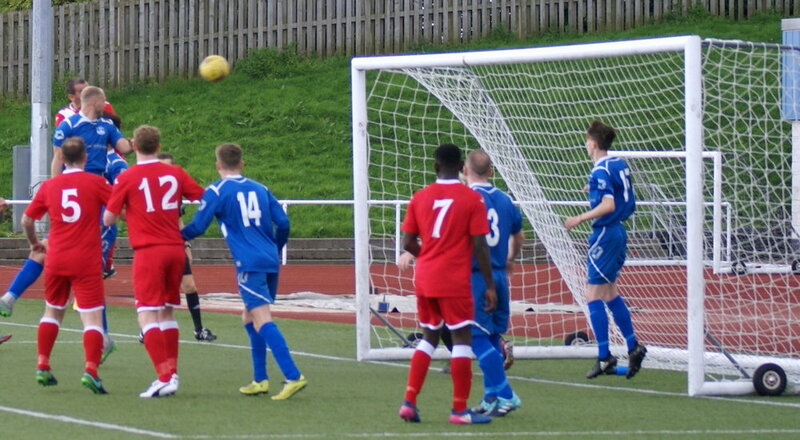 A bad goal to lose for the home side however the Neilston player finished well. The `field had a couple of corners before half time however were struggling to break down a very well organised visiting defence and chances had been at a premium. There were no changes at Half time and the home side knew they had to `up the tempo` to salvage the Match and just as they went in search of an equaliser found themselves 2-0 down. A soft corner on the right at the `Possil` end of the ground was cleared by John Gaynor however as Ashfield players ran out to play offside the ball was delivered back into the box with the Neilston Centre half getting a header in which cannoned off the base of the post and out however the ball broke out to Neilston`s winger McBryde who drove the ball through a ruck of players and into the back of the net to the delight of the travelling support. Ashfield 0 Neilston 2. A real blow for the `field and they immediately made two substitutes bringing on Alan Cairns and Jordan Lynch with Paul Maxwell moving up front to partner Keigan Parker and Dean Leverage on the left and all of a sudden Ashfield`s passes started to flow finding better width and the Midfield two of Friel and McManus started to find some room. The `field were unlucky not to pull a goal back in a crazy couple of minutes as the Neilston Keeper drove the ball at Leverage, with the ball then finding Stevenson who drove the ball into the net however Referee ruled it out for offside. Next a passback from the Neilston Centre half was handled by Tirpoloulos however Parker`s free-kick from the penalty spot area was headed off the line. A minute later however and Ashfield got their reward. Keigan Parker delivered a lovely floated corner to the back post and Paul Maxwell guided his header downwards and into the far corner of the net. Ashfield 1 Neilston 2. The home support began to see the home side work up a real head of steam and 3 minutes later, Kenny Hadden`s long throw in was won by Paul Maxwell in the box with the ball breaking to Keigan Parker on the edge of the six yard box and the Ashfield Striker took one touch before despatching the ball into the roof of the net. Ashfield 2 Neilston 2. It was certainly `game on` and the home side knew there was something on and straight from the kick off the ball was played through to Dean Leverage and as the Neilston Keeper let the ball squirm from his grasp Halliday slipped on the ball before pushing it away with his hand and Referee Lee had no hesitation in pointing to the spot. Ashfield`s Captain Ciaran Friel stepped up and drove the ball home with the aid of the crossbar to the delight of the home support. Ashfield 3 Neilston 2. This had been an amazing turnaround and the visitors were struggling to forage forward with Ashfield pushing high up the park and on the 77th minute further increased their lead with the best goal of the game. Mark McManus who worked tirelessly throughout the Match won the ball in midfield before playing the ball out right to Keigan Parker and the Ex-St Johnstone and Blackpool player cut the ball back to the edge of the box where young Dean Leverage first timed his shot into the roof of the net to start the celebrations. A wonderfully taken goal from the Ashfield youngster. Ashfield 4 Neilston 2. It was difficult to imagine this scoreline after an hour of the Match however the changes to the formation in Ashfield`s set up worked magnificently enabling the `field to produce the type of form that they had been producing in the first tranche of League games. As the Referee brought proceedings to a close, in a Match played in very good spirit, it was the young Ashfield Academy kids that ran on the pitch to celebrate with the home side. A great day all round for Ashfield and commiserations to Neilston and we wish them all the best for the Season. FT:- Ashfield 4 Neilston 2. A lovely winter`s day greeted both teams onto the Saracen Turf for the first League encounter between the teams since the 2010-2011 Season. The `field made a number of changes from last week`s cup Match with a very offensive line up and the Ayrshire outfit were in their away strip of Red with black & white stripe. It was a `carbon copy` of the start of last week`s Match with Gary McLenaghan having to pick the ball out of the net in under a minute. From kick-off the ball was played out to the right wing and with the Ashfield back four appealing for offside the Bankies No 7 took a step forward before driving a low shot into the far corner of the net. An excellent finish from the lad. Ashfield 0 Annbank Utd 1. The `field were up against it in the first quarter with the Bankies swarming forward at every opportunity and McLenaghan and his back four had to look lively on a number of occasions. As the half wore on, the `field started to play their passing game and all of a sudden the pendulum swung. The `field`s equaliser came from a long throw in from Kenny Hadden with Ciaran Friel nipping ahead of his markers before volleying a shot over the Bankies Keeoer and into the roof of the net. Ashfield 1 Annbank Utd 1. The `field were now on form and following a corner a few minutes later, Patrick Cullen got away from his marker however his bullet header was blocked on the line with the ball falling to Ciaran Friel 8 yards out and the Ashfield Captain made no mistake with the rebound. Ashfield 2 Annbank Utd 1. The game swung from end to end for a period and it was Ashfield that went further ahead following an Annbank attack with Billy Stevenson breaking clear down the right flank before delivering the ball across to Keigan Parker who evaded a tackle before lashing the ball into the corner of the net. A great goal from Ashfield. Ashfield 3 Annbank Utd 1. As both teams were looking forward to their half time Cup of Tea, Ashfield delivered the ball into the box one last time and Referee Regan Wallace immediately pointed to the spot. It appeared that Friel when going for a header was pulled back however the decision seemed a bit on the soft side. Anyway Ciaran Friel stepped up and drilled his spot-kick past the despairing arms of the Bankies Keeper to complete his hat-trick. Ashfield 4 Annbank Utd 1. It had been a closer first half than the scoreline would suggest however as tight as the first half was, the second half belonged to Ashfield as they lay siege on the Bankies goal virtually straight from Kick-Off and played some really nice football shooting into the Possil end of the ground. After a period of pressure when Mark McManus almost got on the scoresheet with a shot from 6 yards out which cannoned back of the post, the `field went further ahead from a corner. Keigan Parker`s wicked Corner on the hour mark found Friel outjumping the Bankies defence and his header tore into the back of the net. Ashfield 5 Annbank Utd 1. Ashfield brought on Gordon Passmore for Kenny Hadden however not long after the Bankies reduced the deficit following a mix up at the far post with the Bankies No 11 taking full advantage driving the ball low and hard into the far corner. Ashfield 5 Annbank Utd 2. Ashfield were annoyed at losing this goal and set about trying to increase their lead and this they did shortly after when the ball was played into the path of Graeme Hearton who drew the Keeper out before driving the ball into the net. Ashfield 6 Annbank Urd 2. Further misery was to come for the Ayrshire team as they struggled with Parker`s deliveries into the box and from the other side Keigan Parker`s cross found Paddy Cullen ghosting in at the far post to head in his first goal of the Season to the delight of the home support. Ashfield 7 Annbank Utd 2. The visitors were now wishing the game to finish however to their credit kept on pushing forward at every opportunity however before the Referee brought proceedings to a close it was Ashfield`s Captain, Ciaran Friel who finished off a lovely move for his fifth goal of the game and Ashfield`s eighth. Ashfield 8 Annbank Utd 2. It was just one of the games with the `field looking very good going forward which set`s up the `field nicely for next week`s trip to Rutherglen in the Scottish Junior Cup. The heavy overnight rain had not affected the Celsius Stadium pitch ahead of this eagerly awaiting 4th Round Scottish Junior Cup tie against two teams competing at the top end of their respective divisions. It was one win-a-piece in terms of matches last Season, with the `field winning a West of Scotland Tie at Saracen Park however the Glens gained revenge later in the Season putting the `field out of the Central League Cup. 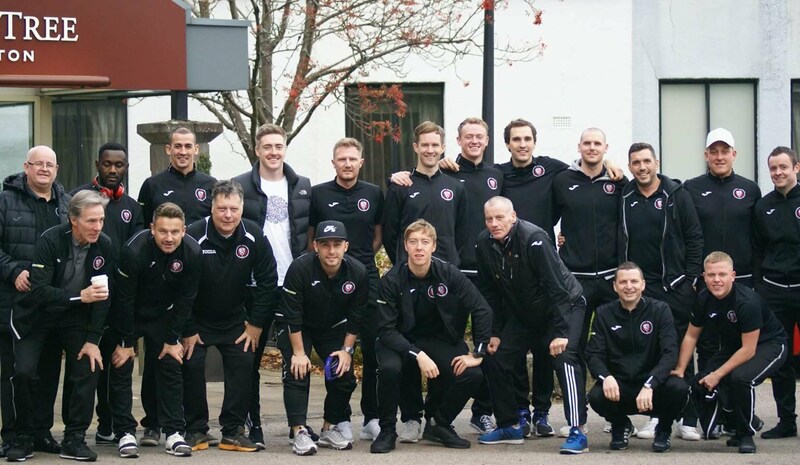 A couple of changes to the Ashfield team following last week`s excellent victory and from Referee White`s first whistle, the game was played at a very high tempo. Ashfield were conscious of the pace of the the Glens attackers however had pace themselves in Graeme Hearton who started the game extremely well linking up well with Keigan Parker. The `field forced the initial play however were restricted to long range shots in the opening exchanges and just as they were beginning to settle into the game, they found themselves a goal down with the home side`s first attack. A long range shot was blocked by young Colin Leverage at the back for Ashfield however the ball broke to Simeone who controlled the ball before drilling the ball low and hard into the back of the net to the delight of the home support. A real blow for Ashfield so early on. R`Glen Glencairn 1 Ashfield 0. This sprung the `field into action and they managed to create some chances firstly with Keigan Parker having a snap shot from outside the box which went agonisingly wide. On 13 minutes however the visitors had a glorious opportunity when Parker was played through and as the Keeper advanced, the Ashfield striker went for power and his shot was brilliantly saved by the Glens Keeper. Shortly after this the `field secured a corner on the far side, which was delivered to the far post with John Gaynor getting ahead of his marker and with six yards out bulleted his header wide of the target. These chances came back to `haunt` Ashfield as the home side began to step up a gear utilising the flanks well and trying to stretch the visitors back four and after a period of pressure got their reward on the 31st Minute. An angled shot from the right took a wicked deflection along the six yard box and it was Harry Mitchell that was first to react and had the easiest of tap ins to put the Glens further ahead. R`Glen Glencairn 2 Ashfield 0. Ashfield had to keep the game tight and were still pushing forward at every opportunity. The Glens Keeper had to be on form again when a 20 yard drive from Kenny Hadden was well saved. However as the game approached Half Time, disaster struck for the `field. The `all important` third goal came when the `field were on attack however once they lost possession, the pace of the Glens front four was there to see as they broke quickly down the right hand side and right on the bye line Del Esplin managed to scoop the ball across the six yard box evading McLenaghan in the Ashfield goal and McArdle headed in the third goal. R`Glen Glencairn 3 Ashfield 0. This was a really sore goal to lose from an Ashfield point of view and certainly put the game almost out of reach for the West Region Division 2 side. Paul Maxwell decided to make an offensive change at Half time, bringing on Billy Stevenson to replace midfielder Jordan Lynch in a bid to claw back the deficit and on the whole defended well and broke well when they could for the next period. Another chance fell to Keigan Parker on the 55th Minute after making a lovely run however again it was the Glens Keeper who thwarted the Ashfield striker and shortly after the game was effectively `put to bed` when a low hard shot from Stevie Kerr from just inside the box went in despite the attentions of Gary McLenaghan in the Ashfield goal. R`Glen Glencairn 4 Ashfield 0. A couple of changes were made with Gavin Goodall replacing Keigan Parker and the Glens brought on top scorer Gary Smith. Unfortunately for the `field this did not stem the tide as the home side started the play with some style and started to `pepper` the Ashfield goal from all angles and on the 71st Minute went further ahead courtesy of a well drilled shot from Simeone for his 2nd of the game. R`Glen Glencairn 5 Ashfield 0. To the `field`s credit they kept plugging away however were now being picked off and with 8 minutes left despite a couple of great blocks from McLenaghan, Gary Smith got himself on the scoresheet. R`Glen Glencairn 6 Ashfield 0. The `field were struggling now and a minute later a speculative shot from Del Esplin bounced over the Ashfield Keepers arms and into the net for Number 7. R`Glen Glencairn 7 Ashfield 0. The `field had to rearrange things following an injury to Billy Stevenson with Dean Leverage coming on and the Ashfield winger made a really good impression and it was from this source that Ashfield got a consolation goal with the ball being played into the box. A glancing header found John Gaynor at the back post and the Ashfield Centre Half drove the ball into the net. R`Glen Glencairn 7 Ashfield 1. The North Glasgow Team were delighted to hear the final whistle and can only look back at what might have been against a very good team in Glencairn. We wish them all the best for the remainder of the Season.